Not everything you've heard till now is absolute truth. However, nobody knows absolute truth about anything. All we know about the things may be accurate up to 99 %, never fully. Here I've come with a story, an untold story about the Titanic. Begin. Titanic on his first voyage. An announcement was made on 14 April 1912 at 11:40 PM a terrifying accident had happened with RMS Titanic in Antarctic ocean and due to this, exactly after 3 hour at 2:20, morning of 15 April 1912, the world's largest ship had been drowned under chilled surface of the sea, not alone, but with 1500 lives. 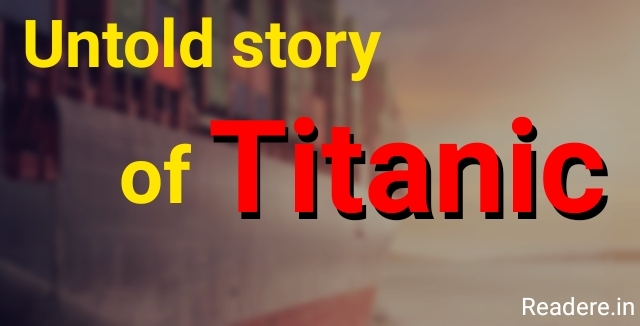 It was told that Titanic had a huge collision with an iceberg in the sea which drilled a hole in it and it sank because water filled it with death. When the Titanic was under construction it was a belief that it was an unsinkable ship. So what caused it to sink on its very first voyage? Actually, researchers have always been neglecting the fact, "Titanic could sink so easily." Today I'll tell you an untold story of Titanic that you've never heard. So let's go. Titanic weighted 46000 metric tons, had a length of 882 feet, a width of 92 feet and a height of 175 feet, it was so huge that if you wish to wander around in every room then you would at least need 2 weeks. The manufacturing cost of the ship was 75 million dollars, adjusted for inflation it is about 170 million dollars today (11,000 crores). It was manufactured by 3000 people with an effort of 2 years because it had a height more than a 20 floors building and that's why it was a difficult task for them at that time. While the manufacturing of the ship, 8 people died falling from the height and 246 injured. A monstrous ship so huge and made with so much effort sank so easily just by a collision, that seems an unacceptable event. A journalist had taken a photo of Titanic before the ship was ready for its first voyage. On observing that photo, the journalist noticed a spot at the bottom of the ship that nobody paid attention to. Later researchers found that the coal was on fire even before leaving. That coal was on fire for about three weeks and nobody was aware of it. We all know that metal under fire becomes red and loses its strength up to 75%. Unfortunately for those onboard, the iceberg collided with the ship at that exact point. It is for sure that if people onboard knew about the fire, the ship would never have sunk. But it was a misfortune-coincidence that sealed the fate of the ship and the people onboard. Due to fire, much of coal had burnt up and it was another coincidence that strike was going in the coal mines at that time. It was a critical situation for the owners of the ship because all ticket of the ship was already sold out. To handle, owners tried to buy coal wherever possible. Even they canceled other ships and brought their coal at very expensive prices. This is how titanic went on his first and last voyage from England to America. Titanic's interior was so beautiful. It's interior was based on Ritz hotel of London. For first class peoples, they were facilitated with lukewarm swimming pool, a gym and, a tennis court. For women, they were with a beauty salon, even an accommodate was given to their pets. There was everything for the welcome of the guests like bears, cigars. But there was no binocular in the ship. This is another misfortune that the worker had been expelled a few hours ago when the ship was ready to leave who monitored the sea through binocular. He took the keys of the box in which binocular was. That's why new worker didn't find binocular. He was perforced to monitor the sea through his naked eye. The last mistake that leads the ship to the sea was made by the captain of the ship "Captain Smith". He ordered workers not to stop ship even after the collision, the reason was, he had got the news that another ship was at a distance of 4 hours and arriving to help them. He thought that if they ran the ship then the rescuer ship would reach to them in 3 hours. But he didn't know that it leads to run water in compartments at a faster rate which further became the reason of 1500 deaths. End. We all know one saying that " if there is misfortune written in one's fate then no one can stop him to ruin." This is what exactly happened with the Titanic.